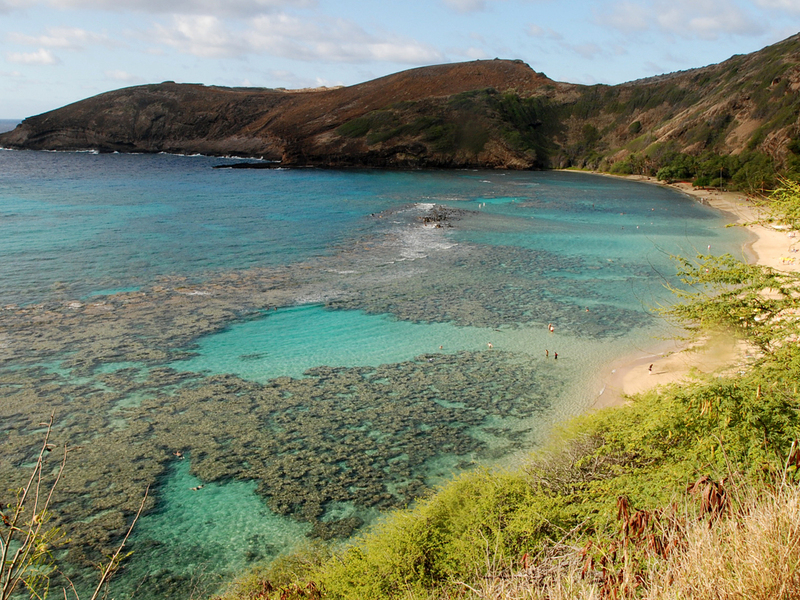 Hawaii Approves Bill Banning Sunscreen Believed To Kill Coral Reefs : The Two-Way If Gov. David Ige signs the bill, popular sunscreen brands including Coppertone, Banana Boat and Hawaiian Tropic will be illegal. Lawmakers say they contain chemicals harmful to delicate marine life. "Amazingly, this is a first-in-the-world law," state Sen. Mike Gabbard, who introduced the bill, told the Honolulu Star-Advertiser. "So, Hawaii is definitely on the cutting edge by banning these dangerous chemicals in sunscreens." The chemicals oxybenzone and octinoxate, which are used in more than 3,500 of the world's most popular sunscreen products, including Hawaiian Tropic, Coppertone and Banana Boat, would be prohibited. As NPR reported, a 2015 study of coral reefs in Hawaii, the U.S. Virgin Islands and Israel determined oxybenzone "leaches the coral of its nutrients and bleaches it white. It can also disrupt the development of fish and other wildlife." Even a small drop is enough to damage delicate corals. Opposition to the ban came from sunscreen manufacturers, including Bayer, the maker of Coppertone. And the state's major doctors group said the ban goes too far. Meanwhile, awareness campaigns about the damage caused by commercial sunscreen have spurred the growth of Hawaiian-made natural products, reported Outside. Many Hawaiian businesses are not waiting for the governor to sign the law. They have begun implementing their own bans. "Nonprofits, athletes and hotels in Hawaii are starting to create their own regulations for what can and can't be used," said Caroline Duell, founder of the Safe Sunscreen Council and owner of a natural-sunscreen company.